A playground for the rich and famous from all corners of the globe, Tuscany has attracted tourists and visitors since the golden age of Michelangelo, Leonardo, and the de' Medicis. From the Renaissance marvels of the Uffizi Gallery in Florence to the colorful costumes of the horse Palio in Siena and the splendors of its hilltop towns, Tuscany combines art, culture, architecture, and natural beauty in a seamless tapestry. 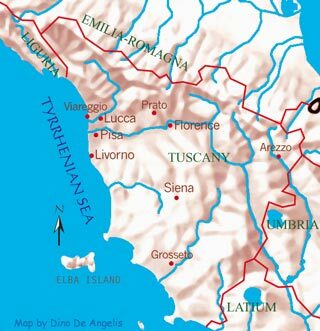 The Etruscans, who likely hailed from Asia Minor, settled in Tuscany around 1,000 B.C., planting vines and olive groves and spreading their influence as far as the islands of Corsica and Elba; the name Toscana (Tuscany in Italian) evolved from the name Etruria, as the land of the Etruscans was called. 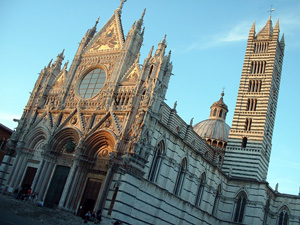 Florence, Pisa, Lucca, and Siena had become independent republics by the eleventh century, and remain four of Tuscany's main cities to this day. Other important centers are Livorno (the region's busiest port), Viareggio (a seaside city with a boisterous Carnevale tradition), Prato (renowned for its textiles industry), Arezzo (birthplace of the poet Petrarch), and Grosseto (nestled in the coastal area known as La Maremma). Mostly hilly and mountainous, with a fertile countryside and generous stretch of coastline, Tuscany is Italy's fifth-largest region and one of its wealthiest. The regional capital, Florence, was the nerve center of the Renaissance, and later the capital of the newly formed Kingdom of Italy from 1865 to 1871. Be sure to subscribe to our blog for recipes and cooking tips! For more recipes, info and tips & tricks, sign up for our newsletter. 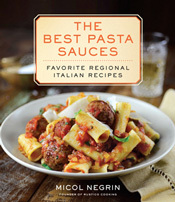 **Bonus recipe available in exclusive companion eBook when you order The Best Pasta Sauces directly from RUSTICO COOKING. Tuscany's food is much like Tuscany's landscape: clean, sober, and soothingly simple. Building their characteristic dishes on a savvy interplay of vegetables, beans, saltless bread, and fruity olive oil, Tuscans are masters at the art of understatement; their favorite aromatics (thyme, rosemary, and fennel) are used judiciously, never squandered or wasted. Sharp sheep's milk cheese from artisanal dairies lends saltiness and pungency to pastas, savory pies, and salads, and robust grains like farro (emmer wheat) add bulk to soups. Tuscans, self-proclaimed lovers of rice, cook risotto with cuttlefish ink, with squab, or with chicken giblets, and often add a handful of rice to vegetable soups. Ravioli and tortelli, the region's classic stuffed pastas, are filled with ricotta or potatoes and pancetta, then napped with butter and sage, tomato sauce, or a meat ragù. Along the coast, fish and seafood play a pivotal role; scorpionfish, monkfish, mullet, and other rock fish are tossed into the pot to create a thick, tomato-laced soup called cacciucco; the trick is using as many varieties of fish as possible, and puréeing the fish (heads, bones, and all) right into the broth. A special breed of cattle known as Chianina provides succulent meat for the grill, and the wild boar that roams the Tuscan woods is transformed into succulent sweet-and-sour stews and rich, rosy hams. Dessert, always more impressive on celebratory days, ranges from a dome-shaped cake called zuccotto to a flatbread studded with grapes, baked since the days of the Etruscans. 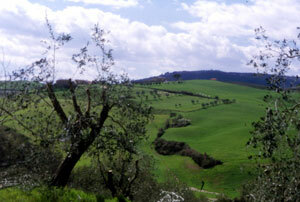 Surprisingly, Tuscany is responsible for only 4 percent of Italy's olive oil production, since its climate and terrain are harsher than those of many other Italian regions: for example, in Apulia (Italy's most prolific olive oil producer), an olive tree yields twenty times as many olives as the same tree planted in Tuscany. This lower yield per tree means that Tuscan olives are a concentrate of flavor and aroma, which makes their oil more pronounced than that generally pressed elsewhere in Italy. In the best of cases, Tuscan olive oil is pressed from olives that are picked by hand when not quite ripe: hand-picking the olives ensures minimal bruising before they are brought to the mill, and picking the olives before they fully ripen yields a more intensely flavored oil. A good selection of Tuscan estate-bottled extra-virgin olive oils is available from pastacheese. This is a simplified version of soufflé since there are no beaten egg whites in the batter to lend volume. We enjoyed this dish at Ristorante Logge del Vignola in Montepulciano and have made it ever since at our cooking classes in NYC. Make the soufflés: Preheat the oven to 400 degrees (preferably set on convection). Generously grease twelve 1-cup ramekins with nonstick spray and sprinkle with bread crumbs. Bake in the preheated oven for 20 minutes, or until golden, puffed, and set. Meanwhile, make the salad: Toss the arugula and tomatoes with the olive oil, salt, and pepper in a medium bowl. Divide among 12 plates. Top with cherry tomatoes, olives, and celery leaves for a more colorful presentation. Similar to Liguria's beloved pesto, the sauce for this pasta is rendered creamy by a good dose of walnuts; substitute blanched almonds for a mellower flavor. Crush the basil, garlic, Pecorino, and walnuts into a semi-smooth paste in a mortar or in a food processor. Add 1/2 teaspoon of the salt. Beat in the olive oil in a thin, steady stream until a creamy paste forms; the sauce will not be smooth. Set aside. Bring 5 quarts of water to a boil; add the penne and the remaining 2 tablespoons of salt. Cook until al dente, then drain, reserving 1 cup of the pasta cooking water. This hearty play on the classic Tuscan bread and tomato salad is perfect for fall. Spread the cubed bread on a baking sheet and toast in the preheated oven for 5 minutes. Cool to room temperature. Marinating the pork for days with red wine and vegetables tenderizes and flavors it. If you are short on time, marinate the pork for 8 hours in the refrigerator or 2 hours at room temperature before cooking. Place the pork in a large container. 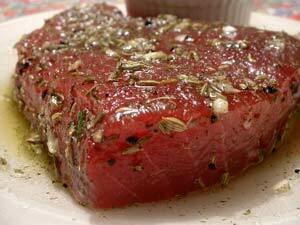 Add the wine, onions, garlic, bay leaves, rosemary, thyme, and fennel seeds. Toss to combine thoroughly and refrigerate for 1 to 3 days, covered; if possible, turn the pork every 8 hours or so (this allows the marinade to penetrate the pork more effectively). When you are ready to cook, drain the pork from the marinade, reserving both the solids and the liquid; blot the pork dry using paper towels (blotting the pork dry encourages browning). Heat the olive oil in a 12-inch sauté pan (terra-cotta or enameled cast iron are best) over a medium-high flame. Add the pork and brown on all sides, turning often to cook evenly, about 8 minutes; this can be done in 2 batches in order to avoid crowding in the pan. Three meats (venison, chicken, and lamb) create a robust ragù best savored over nutty farro polenta. Of course, if obtaining farro flour proves too difficult, serve the game ragu over cornmeal polenta. Make the ragu: Heat the olive oil in a wide skillet over a medium flame. Add the bacon, onions, garlic, thyme, parsley, basil, and bay leaf; cook over medium heat until the onions are soft, about 10 minutes. Add the venison, chicken, and lamb; brown over medium-high heat, stirring, about 20 minutes. Add the wine, broth, cloves, coriander, cinnamon stick, salt, and pepper. Bring to a boil; cover and cook over medium-low heat for 1 and 1/2 hours hours, or until tender, and adjust the seasoning if needed. Discard the bay leaf and cinnamon stick. Meanwhile, make the polenta: Bring 8 cups of water to a boil in a heavy 4-quart pot. Add the salt and the farro flour to the boiling water in a thin, steady stream, whisking all the while. Bring to a gentle boil (watch the bubbling from the pot) and cook, stirring every 5 minutes or so, until done, about 45 minutes over low heat. When the polenta is done, stir in the butter and Parmigiano. 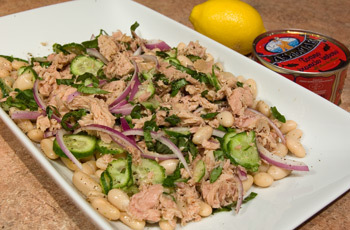 In the recipe below, tuna is rubbed with favorite Tuscan spices (rosemary and fennel seeds), then grilled and served in thin slices. Heat a 14-inch grill pan over a high flame for 5 minutes. A few years ago, when my husband and I were in Tuscany, we stopped for lunch at an unassuming roadside trattoria near Lucca. There was no menu: only the owner, making his way from table to table, enticing diners with descriptions of the day's offerings while his wife and mother cooked in the tiny kitchen. Among the homemade pastas, we ordered cheese ravioli in duck ragu--one of the best primi I have ever sampled. The duck was absolutely tender, not at all fatty, with a hint of fennel seeds that brightened the dish. Unlike many duck ragus I have eaten over the years, this one was barely red--only enough tomatoes to give the sauce body and sweetness, not so much as to mask the taste of the meat. A delicate dusting of sharp Pecorino rounded out the flavors. Although I wasn't able to get a precise recipe from the chef that day, I swore I would try to replicate the ragu at home in New York City. After a few tries, I finally got just the right balance of flavors. My duck ragu was as good as the one we had enjoyed in Tuscany--well, almost! I love the ragu tossed with Ricotta-filled ravioli, but it is also delicious with a simple fresh egg pasta--pappardelle or tagliatelle are perfect. I suggest you make a double or triple batch and freeze some so you can enjoy it later. Invite your most discerning guests to dinner, open a bottle of Rosso di Montalcino, and indulge in a taste of Tuscany without ever leaving home. Place the duck thighs upside down in a heavy cast iron pot. Cook over medium-high heat until golden-brown on the bottom, about 10 minutes. Flip the duck thighs with tongs. Cook until the other side is also golden brown, about 5 minutes. 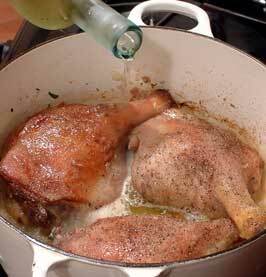 Remove the thighs from the pot and tip out the fat in the pot. Return the pot to the heat. Add the olive oil and heat it over a medium flame. 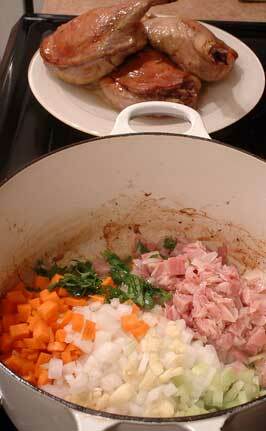 Add the onion, carrot, celery, Pancetta, bay leaf, parsley, thyme, and basil. Cook the vegetables and Pancetta 5 minutes, or until soft and lightly browned. Return the duck to the pot and season with 1/2 teaspoon of the salt and the pepper. Cook until the wine nearly evaporates, about 5 minutes. Stir in the tomatoes; cover and cook over medium-low heat 1 and ½ hours. 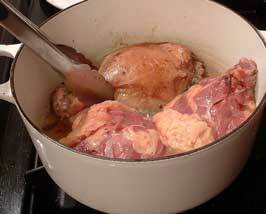 Remove the duck from the pot, cool 15 minutes (or until cool enough to handle), then slip off the skin and discard it. Cut the meat into 1/4-inch cubes; return the meat to the pot. Stir in the fennel seeds and cook over medium heat 30 more minutes; the duck should be fork-tender (cook longer if it is not). This is the finished duck ragu; it can be refrigerated for up to 3 days or frozen for up to 1 month. 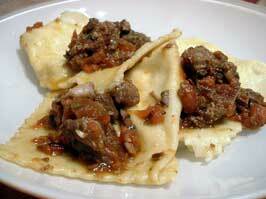 When you are ready to serve the ravioli, gently warm the duck ragu over a low flame. Bring 5 quarts of water to a boil. Add the ravioli and the remaining 2 tablespoons of salt to the boiling water and cook the ravioli until they are al dente, about 4 minutes. Drain the ravioli, reserving 1/2 cup of the pasta cooking water. Transfer the ravioli to a bowl, gently fold in the ragu, and dilute with as much of the reserved pasta cooking water as needed to give the ragu a coating consistency. Ribollita is one of Tuscany's most beloved soups. Made in humble country kitchens, it combines the region's saltless bread, prized beans, and hearty cavolo nero (literally translated, black cabbage--in fact it is Lacinato kale). Ribollita is a dish meant to be reheated; its very name means "boiled twice." Every cook makes his or her own version, but all versions include onions, carrots, celery, beans, cavolo nero, and bread... not to mention plenty of olive oil. I suggest you make a lot (the recipe below yields enough for 8 servings, but it can easily be doubled or even tripled; just watch the salt, as you can't double or triple it without risking a salty soup). This recipe calls for canned beans; in Tuscany, purists would frown on using canned beans and would reach only for dried beans. 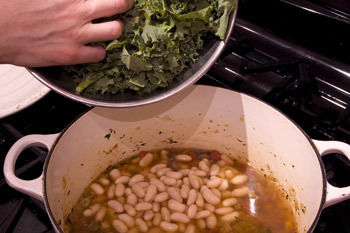 To make ribollita with dried beans, the procedure will be different from the one described here: first soak the beans overnight in plenty of cool water, then drain, cook in plenty of fresh water, and puree a portion before adding to the soup; 1 and 1/4 cups of dried beans is roughly equivalent to the 2 cans of beans suggested here. Place 1/4 cup of the olive oil in a deep, heavy-bottomed saucepan or pot (cast iron or enameled cast iron work well). 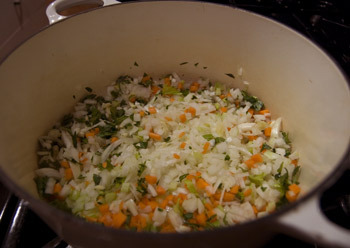 Add the onions, garlic, parsley, carrots, and celery to the pot and stir. Season with the salt and pepper. Cook over medium heat for 20 minutes, stirring often to encourage even browning and to prevent scorching or sticking. If needed, add little water to the vegetables in the pot. When the vegetables are golden and soft, the base (or soffritto) is ready. Add the tomatoes to the pot and stir well to incorporate. Cook 5 minutes, or until the tomatoes lose their raw scent. Add all but 1 cup of the drained and rinsed cannellini beans to the pot and stir again. Add the water to the pot and stir well. 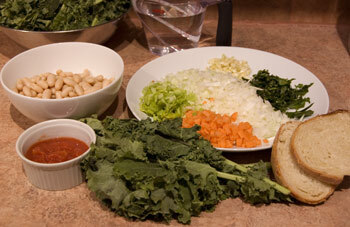 Stir in the kale and bring the soup to a boil. At this point it will seem like there is way too much kale in the pot, but as the soup simmers for hours, the kale will cook down to a soft, silky mass and will shrink a lot. Stir the bread into the pot; I like using bread with the crusts on, but in Tuscany, the crusts are usually omitted. Cover with a lid and reduce the heat to low. Simmer the soup for 2 to 3 hours, stirring once in a while and adding a bit of water if needed to maintain a soupy (but thick, almost porridge-like) consistency. If the texture of the soup is too thin, remove the lid and cook the soup, uncovered, until nicely thickened. The final consistency of the soup has a lot to do with the type of bread you use; the denser the bread, the thicker the soup, since dense bread absorbs more liquid than light, airy bread. Tuscan bread is very dense and chewy, ideal for ribollita and other bread-based soups. 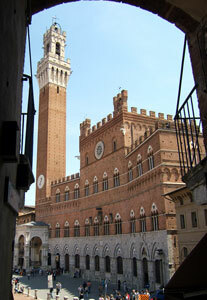 Tuscany, like Piedmont, has earned world-wide fame for its wines, most of which are big, imposing reds. Brunello di Montalcino: The region's most prestigious red, vinified from Sangiovese Grosso; aged 2 years in casks, it is heady, with tobacco, dried fruit, and plum notes. Carmignano: Low-acidity red with firm tannins and hints of chocolate. Chianti: The most characteristic Tuscan Sangiovese-based red; its best incarnation is Chianti Classico, vinified between Florence and Siena. Morellino di Scansano: Dry, austere red best aged 2 to 3 years. Rosso di Montalcino: Brunello's younger brother; aged 1 year in casks. Rosso di Montepulciano: A faster-maturing, lighter red than Vino Nobile di Montepulciano. Super Tuscans: Prestigious blends of Sangiovese (Tuscany's prized red grape) and non-native varietals like Merlot and Cabernet; the category includes expensive wines like Tignanello and Sassicaia. Vernaccia di San Gimignano: Tuscany's most important white; smooth, nutty, with notes of fruit and honey. Vin Santo: Raisined dessert wine with an amber hue and dry, semi-sweet, or sweet flavor. 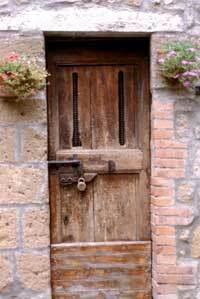 Vino Nobile di Montepulciano: Noble, full-bodied, and robust red. Sheep's milk cheeses are plentiful in Tuscany; some are soft and buttery, others sharp, tangy, and firm, but all are delicious accompanied by Tuscany's unequaled saltless bread. Marzolino: Soft sheep's milk cheese produced in March (marzo in Italian); briefly aged. Pecorino Toscano: Sheep's milk cheese, young (soft, mild, and milky) or aged (firm, pungent, with notes of chestnuts, bay leaves, and herbs); the best is from Pienza and Siena. Raviggiolo: Sheep's and goat's milk cheese (with cow's milk sometimes added) similar to Ricotta; aged 5 days, spreadable, buttery, and creamy. Rossellino: Salty, firm Pecorino whose rind is rubbed with olive oil, acquiring a red (rosso) color as it ages. Toscanello: Larger wheel of Pecorino Toscano; aged 6 months, sometimes spiced with black peppercorns. Like every other Italian region, Tuscany makes the most of its pigs: salami, hams, lard, and more are favorites of the antipasto table. But lesser-known specialties, such as air-dried cured beef or wild boar hams, are equally delectable. Biroldo (or Buristo or Sanguinaccio): Sweet blood pudding with pine nuts, spices, and, sometimes, raisins. Coppiette: Dried salami-like bars of cured boar or beef. Finocchiona: Imposing pork salami spiced with wild fennel (finocchio in Italian); aged 6 months to 1 year. Lardo di Colonnata: Lard rubbed with spices, placed in a salt brine in marble tubs, and aged; eaten raw. Mortadella Nostrale: Pork sausage spiced with black pepper; aged over 1 month. 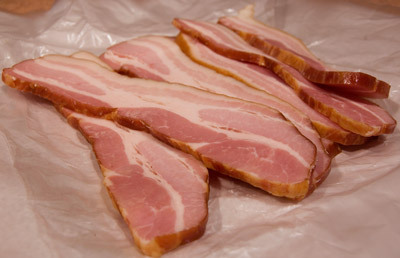 Pancetta (or Rigatino): Unsmoked bacon; served raw as an antipasto or cooked. Prosciutto di Bardotto: Made from the thigh of a "hybrid" pig born from the union of a sow and a wild boar. Prosciutto di Cinghiale: Intensely flavorful wild boar ham; usually sold with the bristle still on. Prosciutto Toscano: Tuscan ham, smaller and saltier than that from Parma and San Daniele; best cut with a sharp knife. Salame Toscano: Pork salami; sometimes flavored with garlic. Soppressata (or Testa in Cassetta or Mallegato): Various cuts of pork are ground, spiced, stuffed into casings, and pressed under weights, then aged. If there's one thing I love about Tuscan cuisine, it's the soups. Hearty, stick-to-your-ribs soups full of good-for-you beans, grains, and greens. Others may love the grilled steaks, the peppery beef stews, the delicate sugar-dusted pastries. I love the soups. I am driving to Montepulciano for an afternoon in the wine cellars and an evening at a trattoria whose soups are said to be heavenly. 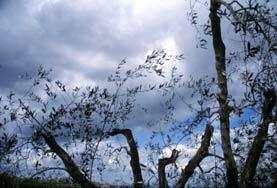 Autumn is approaching, its gray chill descending fog-like over the verdant Tuscan countryside. It's soup weather in Tuscany, and I couldn't be happier. Cibreo: Via Andrea del Verocchio 8/R, Florence, 011/39/055/2341100. Try anything chef/owner Fabio Picchi suggests. Da Giulio in Pelleria: Via delle Conce 45, Lucca 011/39/0583/55948. 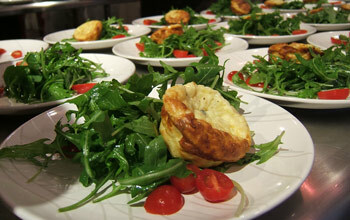 Owner Paolo Sari offers rustic cooking at its best; try the sweet Swiss chard pie. Il Latini: Via dei Palchetti 6/R, Florence, 011/39/055/210916. Informal dining; soups and grilled meats are superb. Seating is family-style at large wooden tables. Enoteca La Fortezza: Piazzale Fortezza, Montalcino, 011/39/0577/849211. A wonderful selection of wines. Gastronomia I Parmigiani: Via Mazzini 1, Forte dei Marmi, 011/39/0584/89496. A great choice of cheeses, meats, grappa, honey, and more. Pasticceria Salza: Via Borgo Stretto 44, Pisa, 011/39/050/28296. The best sweets in the city of the leaning tower. Torteria Gagarin: Via del Cardinale 24, Livorno, 011/39/0586/843656. The place to buy torta di ceci (chickpea tart) and other savory pies near the city's market. Bagno Vignoni: Hamlet in Val d'Orcia with a functional Roman bath and medieval square; stay at Hotel Posta Marcucci (www.hotelpostamarcucci.it). Brunello di Montalcino: One of Italy's best red wines; sip with game and fowl or aged cheeses. Cantuccini: Almond biscotti (twice-baked cookies) dipped in Vin Santo, a dessert wine; the best are baked in Prato. Carnevale in Viareggio: Held since the late 1800s, this colorful celebration features floats, masks, music, and good food; see viareggio.ilcarnevale.com. Finocchiona: Large pork salami spiced with wild fennel; best with saltless Tuscan bread, it is available in salumerie (the Italian equivalent of the delicatessen) and in trattorie. Horse Palio in Siena: Historical horse race held in the medieval city of Siena in July and August; visit www.comune.siena.it/contenuti/palio/palio_index.htm for details. Mercato Nuovo in Florence: Also known as the Porcellino Market; a fun place to buy leather goods and more. 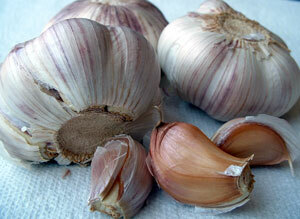 Pici: Fat spaghetti-like pasta; lovely with an aromatic garlic sauce, ragù, or tomato sauce. 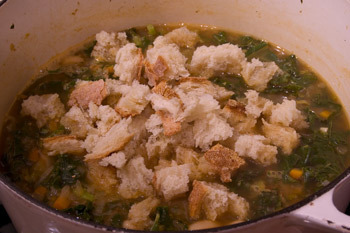 Ribollita: Winter vegetable soup featuring greens, beans, and bread.